The draw was made by individuals not assisting the draw. After the first draw was made pitting USA vs. Argentina, the second draw was not needed. Another draw was also made to decide the dates. Argentina defeated USA (6-1) with Guillermo Stabile and Carlos Peucelle, each scoring twice. Decades later USA’s goalscorer in the match, James Brown complained of Johannes (John) Langenus’ refereeing. According to Brown, Langenus allowed the Argentines to kick them all over the field. 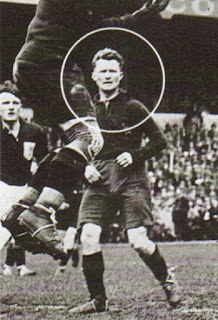 USA’s Ralph Tracy’s leg was broken as early as the tenth minute and the Americans were forced to play with one less man. 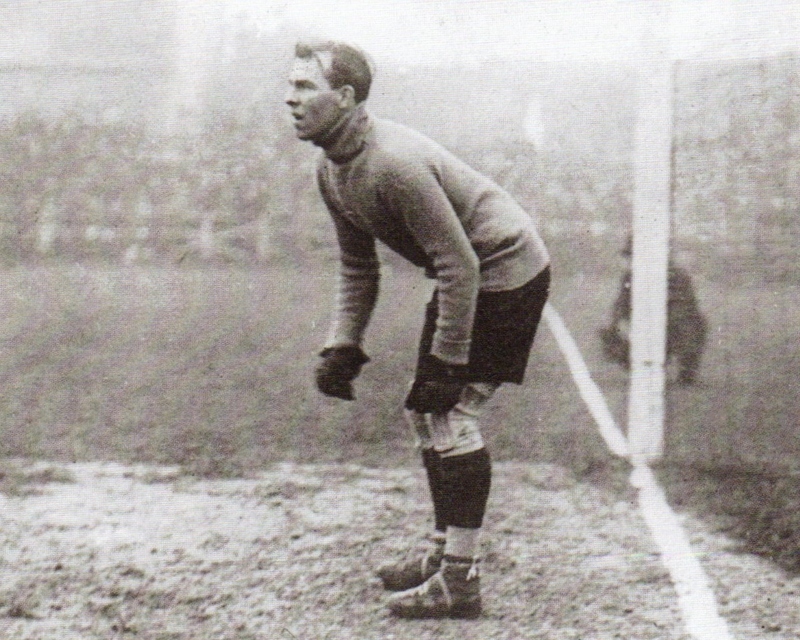 The USA goalkeeper Jim Douglas was also injured. 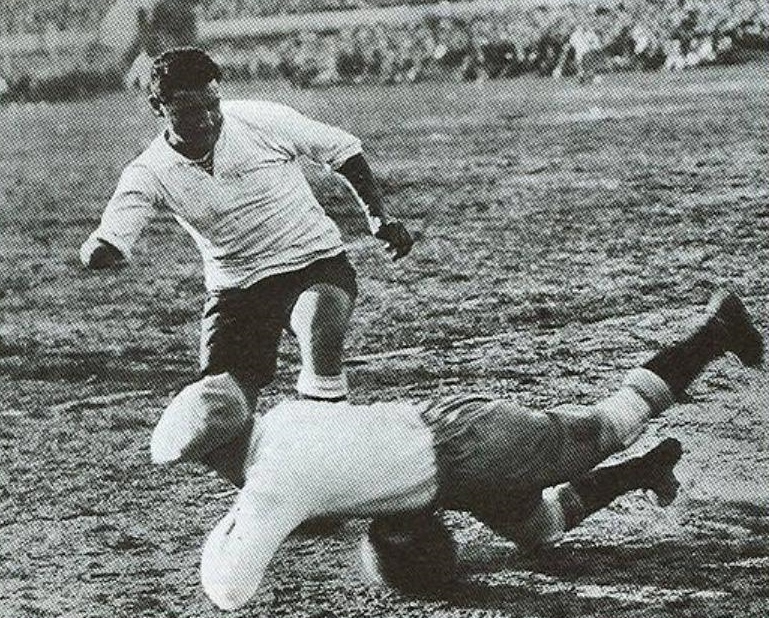 In Addition, USA’s Andy Auld played with a rag in his mouth as he was kicked by an Argentinean opponent in the mouth. James Brown also claimed that Argentina’s left-back kept throwing mud in his face. Argentina scored first in the 20th minute. Andrew Auld fouled Peucelle that led to a free kick. 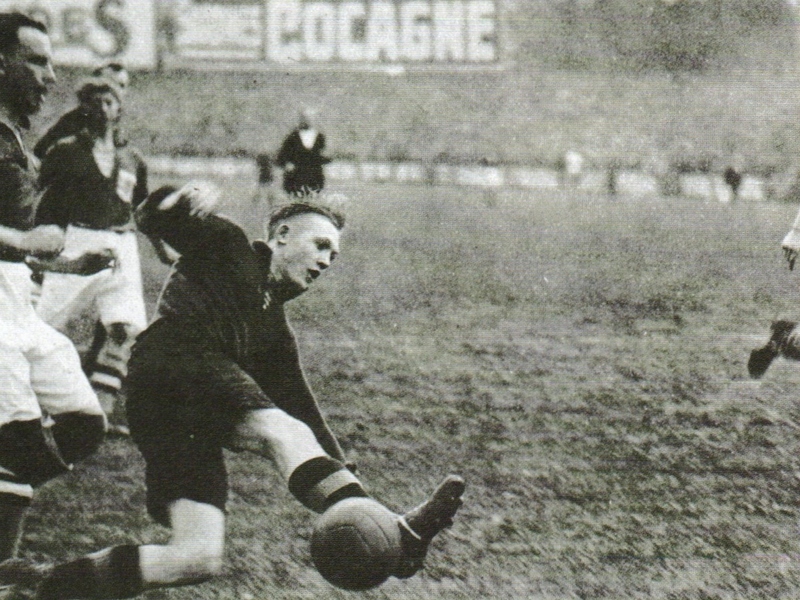 Peucelle took the ensuing dead ball that was deflected by Moorhouse and Monti shot the rebound between Douglas’ legs. 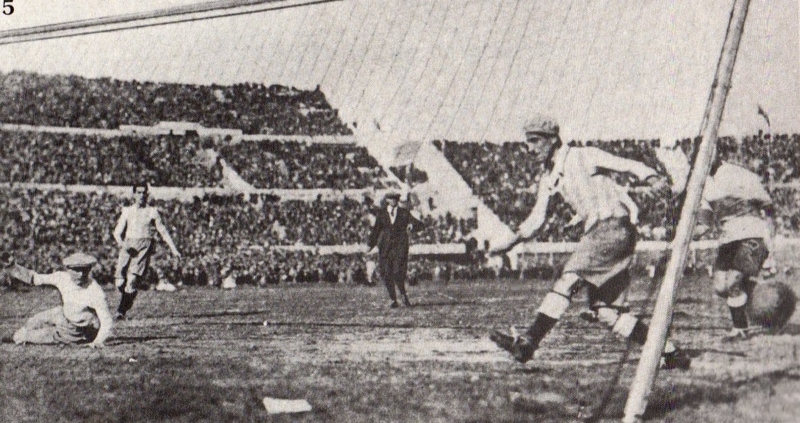 In 56th minute, Carlos Peucelle assisted Alejandro Scopelli for Argentina’s second. In the 69th minute, Evaristo crossed for Stabile whose header hit the post before going in. In the 80th minute, Manuel Ferreira passed to Evaristo, whose low cross could not be reached by neither Wood nor Scopelli, but Carlos Peucelle picked it up and scored. Carlos Peucelle scored another a few minutes later, before Stabile also scored another from another Evaristo cross. Just before the end USA’s James Brown took a shot that deflected off of Fernando Paternoster and back to Brown who scored a consolation goal. 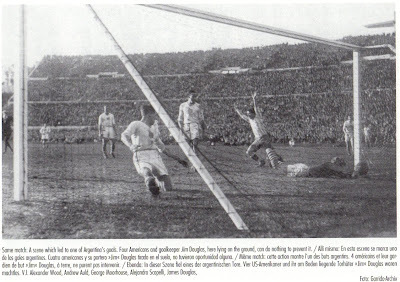 -In the other Semifinal, the hosts defeated Yugoslavia (6-1) on July 27th, 1930, at the Centenario with the same lineup as the match vs. Romania. Yugoslavia took the lead first in the 4th minute. Aleksandar Tirnanic crossed from the wing, Lorenzo Fernandez failed to clear and Djordje Vujadinovic scored for the guests. In the 18th minute, Dorado crossed into the box, after some rebounds (as Yugoslavia could not clear) the ball reached Anselmo whose shot was stopped by the goalkeeper but Cea followed through to score. 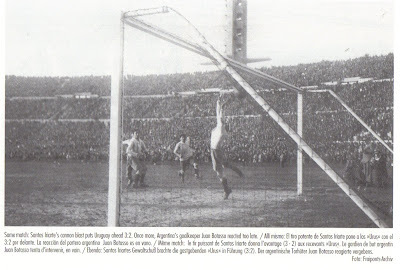 Just two minutes later, Santos Iriarte’s cross drew out the Yugoslavia goalkeeper and Anselmo scored. 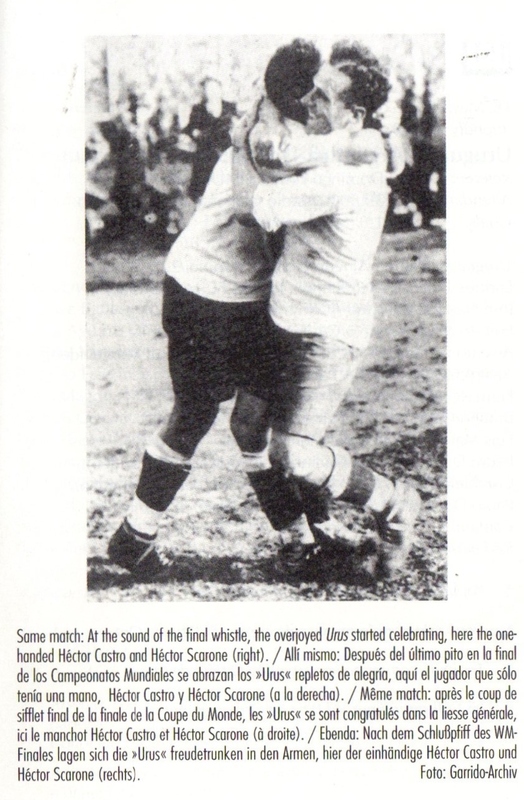 In the 31st minute, Iriarte takes another cross that Scarone did not reach but it reached Dorado. Dorado passed it back in the middle to Lorenzo Fernandez who immediately gave it to Anselmo to score. In the 61st minute, a foul was called on Scarone. 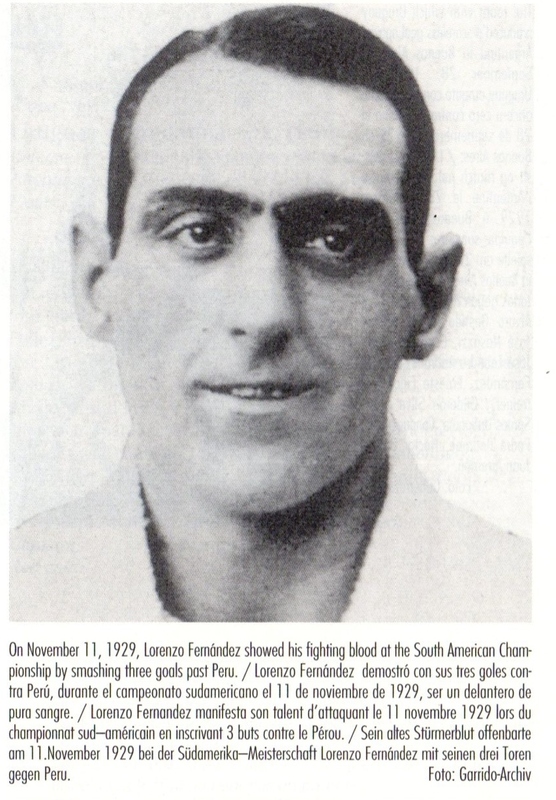 Lorenzo Fernandez pretended to shoot at the Yugoslavian wall, but instead passed it to Santos Iriarte to score. In the 67th minute, the Yugoslavian defense was unable to handle an Iriarte cross and Cea pounced on the loose ball for the fifth. By now rain had also started. In the 72nd minute, Dorado crossed for Anselmo, whose hard shot hit the crossbar. 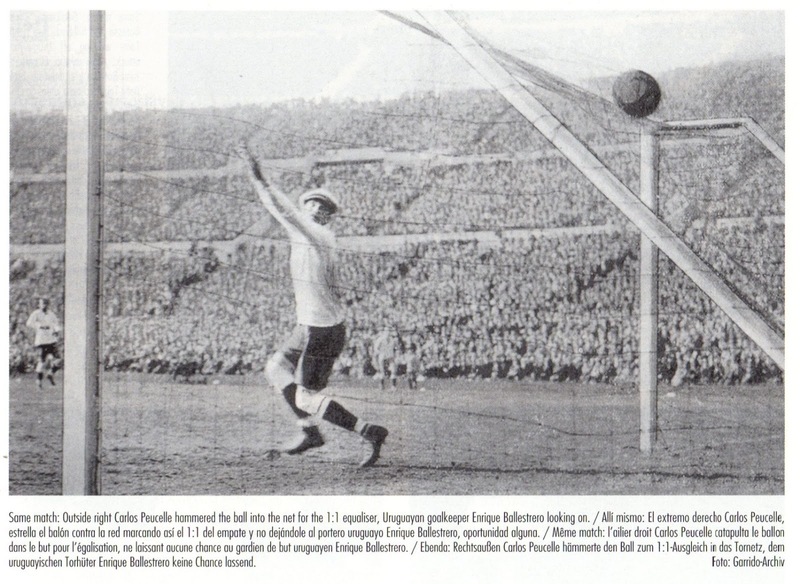 Cea picked up the rebound and after evading a Yugoslavia defender he scored the sixth. 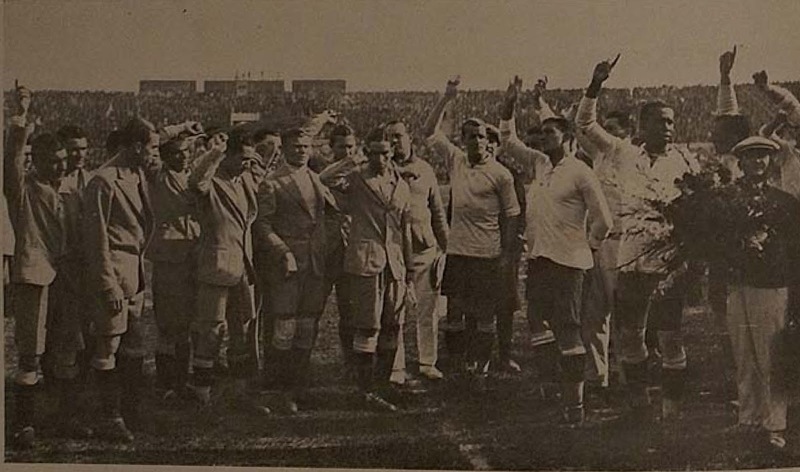 -According to some, Yugoslavia refused to take part in the Third Place match in protest after the performance of the Brazilian Referee Gilberto de Almeida Rêgo in this match. The Yugoslavs had scored a goal in the 9th minute that was called off. In addition Uruguay’s third and fourth goals were awarded despite infractions. The Third goal was clearly offside. On the fourth goal, the ball was clearly out of play before being kicked in from someone on the sidelines in the run-up that led to the goal. There others that claim that no Third Place match was ever planned regardless. 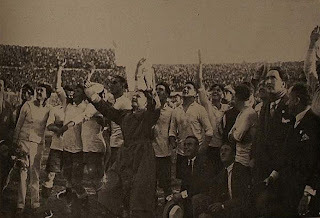 -The Final of the World Cup was a replay of the 1928 Olympics that also paired Uruguay and Argentina. -Many Argentineans had arrived for the match by coming across the River Plate. The Uruguay police fearing violence searched them at the docks for guns and confiscated any weapons found. -The capacity of the Stadium was reduced by 10,000 for security concerns. Match Referee Johannes (John) Langenus had to receive guarantee of safety from the organizers for himself and his assistants before agreeing. According to Langenus, a Newspaper in Uruguay had propped up anti-Argentinean sentiment. -There were 400 journalists present on day of Final (none from Europe). 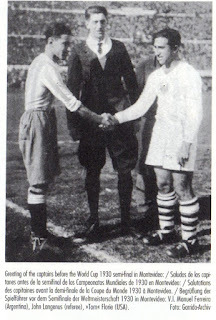 Pierre Billotey (Journalist with Le Journal) , along with Bora Jovanovic, who wrote for Belgrade-based paper Politika, and Romanian Marcel Beilis, a journalist for Gazeta Sportirilor (Bucarest), Vienna Sportsblatt and Football (France) magazine were the only professional European journalist to travel to South America. -The Argentina squad entered the field first at 2:10 PM. -For the World Cup, each team wanted to play the final with its own ball. The Belgian referee Johannes (John) Langenus made a compromise whereby each half would be played with one of the balls. 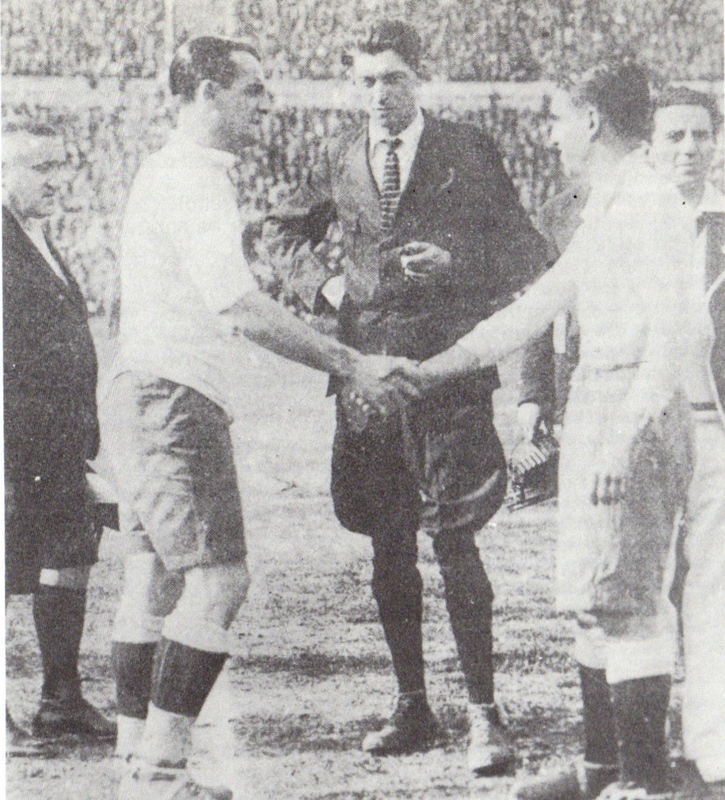 Argentina won the coin toss and would provide the ball for the first half and the Uruguayans would provide their own for the second. -Uruguay took the lead first in the 12th minute against the run of play. Pedro Cea passed to Castro who gave to Scarone. 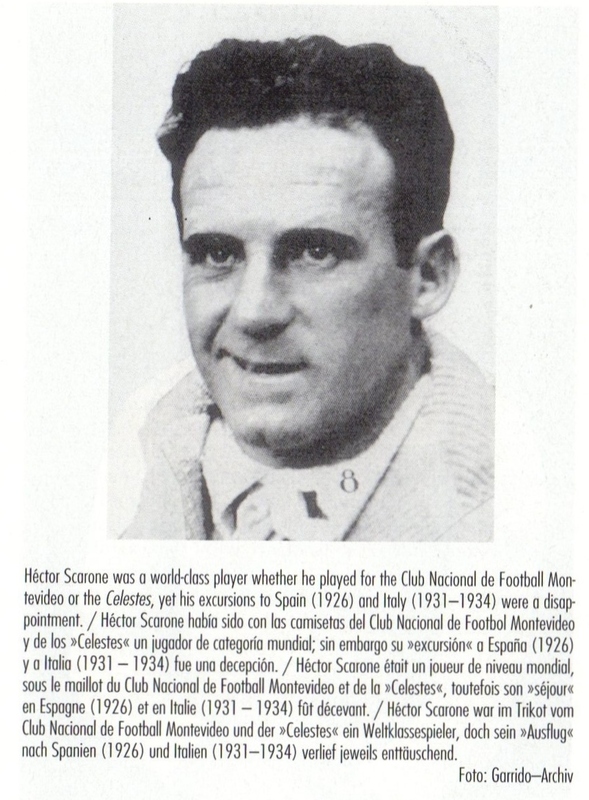 Scarone’s shot was blocked by Fernando Paternoster. Hector Castro passed back to Dorado, whose shot went between Botasso’s legs, with Evaristo trying in vain to stop but unable. Argentina tied the match in the 20th minute. Lorenzo Fernandez fouled Manuel Ferreira. Evaristo took a free kick that evaded Nasazzi. Mascheroni stayed in place instead of covering Francisco Varallo. Varallo crossed for Peucelle who scored the equalizer. Argentina took the lead in the 37th minute. 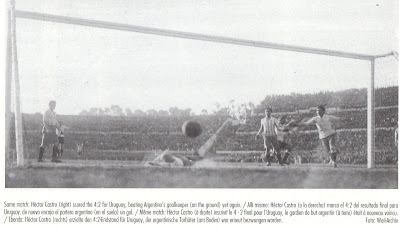 A shot by Hector Castro hit the bar; from there Evaristo started an Argentina counter-attack and sent a long pass to Monti. At this point Nasazzi slowed down and raised his arm after seeing Ferreira and Stabile in seemingly in an offside position. The ball reached Stabile who scored with only the goalkeeper to beat. Nasazzi protested the decision. Langenus consulted with his Linesman Henri Christophe before validating the goal. Uruguay tied the match at (2-2) in the 57th minute. Pedro Cea was fouled in middle by Jose Della Torre. Lorenzo Fernandez took a free kick towards Castro who in turn gave it Scarone. Scarone passed to the left side (with Botasso exposed) and Cea scored. 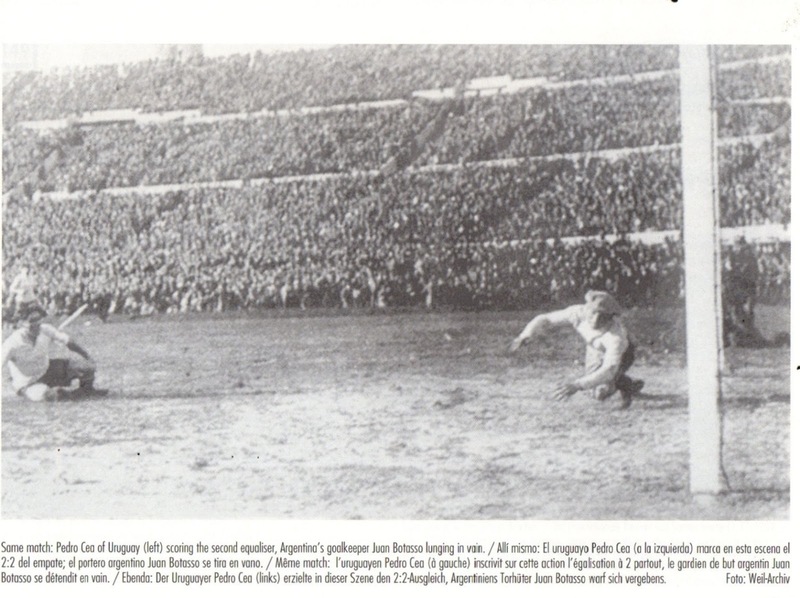 In the 68th, Mascheroni broke an Argentina attack from Varallo and took the ball upfield with no one impeding him. Finally Monti rushed to cut him. Mascheroni crossed for Scarone, who feinted a shot and crossed for Iriarte on the left wing who volleyed home the third goal. In the 85th minute, Andrade saved a Varallo effort on the line. Just before the end, Scarone passed to Dorado, who crossed for Castro who headed in despite pressure from Jose Della Torre. 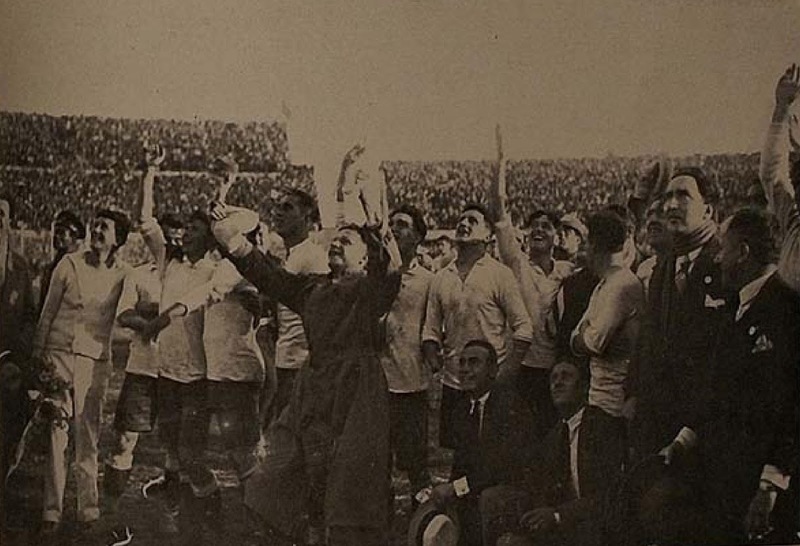 -Uruguay became the very First World Cup Champions in their Centenary year. -At the Final whistle, the Argentina players were very sportsmanlike and applauded the Uruguayans. -The Uruguayan Government decreed the following day, July 31st, to be a National Holliday. -In Argentina there were protests in front of the Uruguay Embassy. The Police were forced to fire on the protestors. -The World Cup was deemed a Financial success. 434, 000 fans had attended the 18 matches. This figure was one quarter of the population of Uruguay. 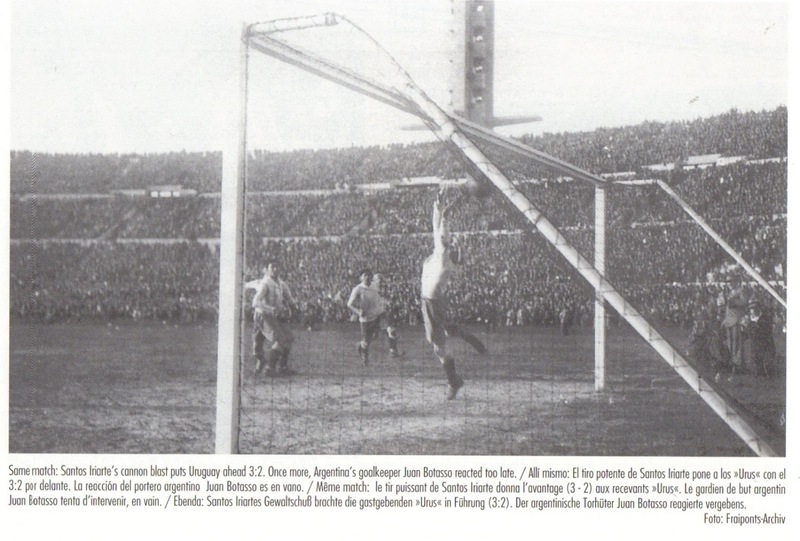 -The cheapest ticket prices for matches was 0.20 Piastre Uruguaya, equivalent to 4.6 French Francs at the time. - The following Uruguay Players were also part of the 1924 Paris Olympics winning side: Jose Andrade, Pedro Cea, Jose Nasazzi, Pedro Petrone, Zoilo Saldombide, Hector Scarone and Santos Urdinaran. -The following Uruguay Players were also part of the 1928 Amsterdam Olympics winning side: Jose Andrade, Pedro Cea, Jose Nasazzi, Pedro Petrone, Hector Scarone, Santos Urdinaran, Peregrino Anselmo, Hector Castro, Lorenzo Fernandez, Alvaro Gestido, Angel Melogno and Domingo Tejara. 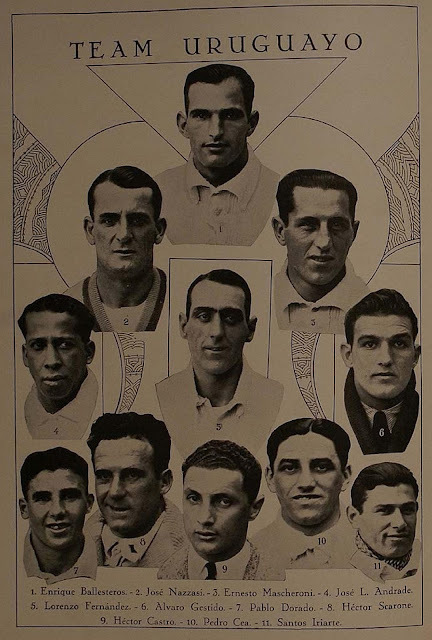 -The following Argentina Players were also part of the 1928 Amsterdam Olympics and reached the Final: Angel Bossio, Fernando Paternoster, Juan Evaristo, Alfredo Zumelzú, Rodolfo Orlandini, Natalio Perinetti, Manuel Ferreira, Roberto Cherro and Luis Monti. 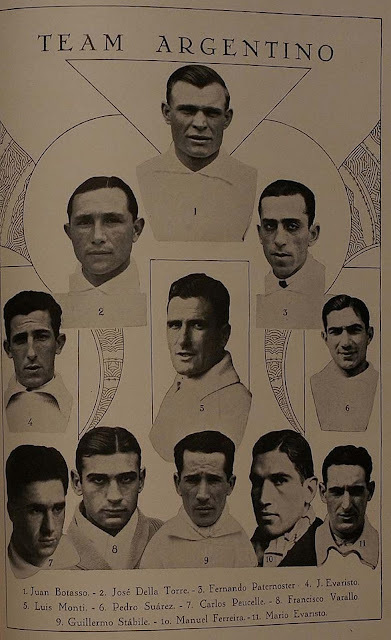 -Uruguay Manager Alberto Horacio Suppici (November 20, 1898 – June 21, 1981) was also known as ‘El Professor’. He is very first and the youngest ever coach to win a World Cup, aged 31. Many have questioned his exact role in managing Uruguay. It is believed that he was more of a physical trainer and not a strategist. 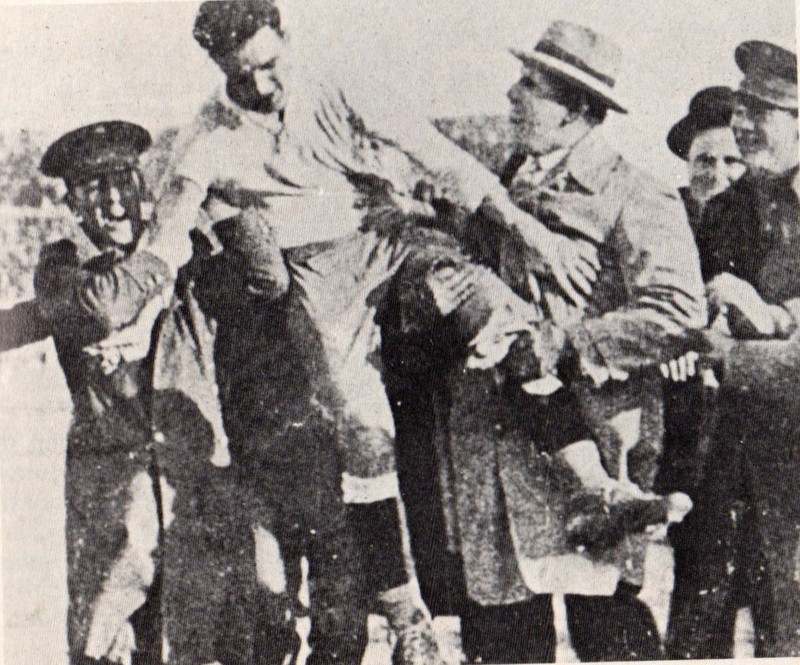 The Technical Commission and the players (led by Jose Nasazzi) determined tactics. In Between the Semifinal and the Final he had visited Buenos Aires. The Argentineans had ten boats to sail towards Uruguay on the day of the Final, leaving from Buenos Aires, Rosario and La Plata. He learned only the day before the Final that he would referee the match. The Boat returning to Europe was scheduled to depart at 3 PM on the day of the Final. He convinced the boating company to delay their departure by two hours so that he would be able to make it. He saw many Argentineans departing from Buenos Aires, holding signs ‘Argentina, Si! Uruguay, No!’. He took a boat from Buenos Aires to Montevideo that many people rushed into. That night Sports Journalists kept knocking on his cabin door for an interview. Because of heavy Fog, 8 out of the 10 boats had been delayed and only arrived after the match had ended. There were security concerns and the Belgian Federation accepted only by mid-day that Langenus would referee the Final. The plan was to leave the stadium immediately after the match so that he would make it to the boat. He did hear rumors that the Argentinean players were threatened. Another rumor that according to him was false was that the Police had helped him escape from the stadium. In actuality, him and his compatriot Assistant from Belgium, Henri Christophe were driven to the port with two Police cars to avoid traffic. Once he reached port, the ‘SS Duilio’ had not even reached the port because the fog had delayed its arrival. He was eventually informed that the boat would arrive the following morning. That day he saw no cars in the streets only crowds celebrating. -A month later on September 6th, 1930, Argentina’s President Hipolito Yrigoyen was deposed in a Coup. -Uruguay’s trio of José Andrade, Lorenzo Fernandez, Alvaro Gestido were called ‘La Costilla Metallica’ (The Iron Curtain). -There has been much speculation over the decades about Argentina International and hard-man Luis Felipe ‘Luisito’ Monti’s poor display in the Final. By his standards and in comparison with the previous matches in the World Cup itself, he appeared to have a quiet game. The one theory speculated is that his life was threatened and as a result he played below standard. -On the very day of the World Cup Final (July 30th), Joan Gamper, the Swiss-born founder of FC Barcelona committed suicide. -Raul Jude, the President of Uruguay Football Federation, received the World Cup Trophy from Jules Rimet at the post match dinner after the World Cup Final. -Most Europeans had been surprised by the standards of refereeing from the South Americans. Shoulder charges were called as foul, but kicks on the shins were ignored. 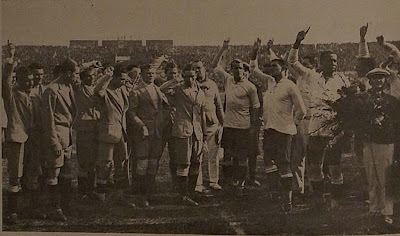 -After their elimination, France played a Friendly vs. Uruguay’s ‘Club Nacional de Football Montevideo’ and won 3-2. 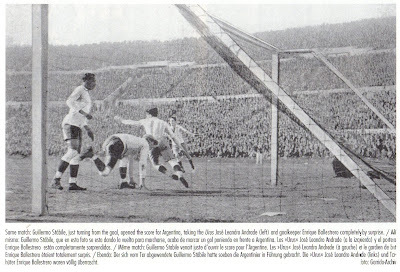 -On the trip back, since The Final Referee was the Belgian John Langenus, many Argentinean fans harassed the Belgians. Projectiles were thrown at motor coach taking them to the port. 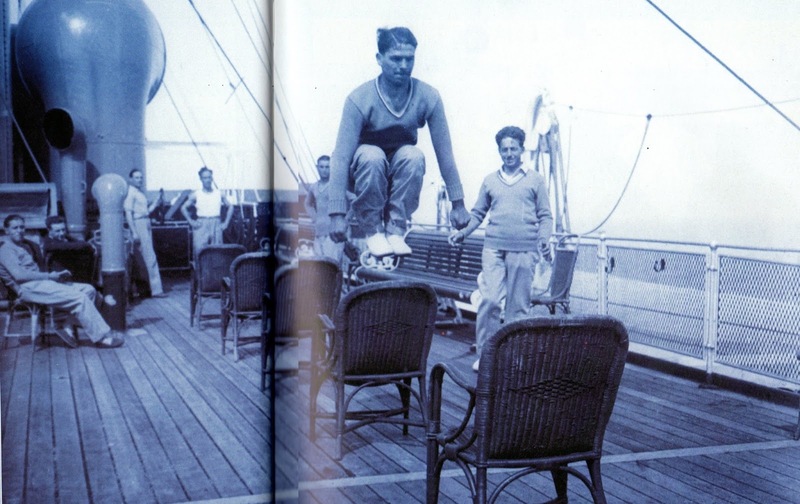 -The Following day, July 31st, the French, Belgian and Romanian Delegations took the Italian Ocean Liner ‘SS Duilio’ for another two weeks on the sea. Belgian Referee Johannes (John) Langenus was on that ship as well. On the way back, they must had a layover in Brazil, because France played a Friendly vs. Brazil on August 1st at Rio de Janeiro that Brazil won 3-2. The French Federation did not consider the match vs. Brazil as an Official match, though Brazil did. Interestingly the scoreboard in the Stadium showed the score as 6-1. According to some sources, they also played a Friendly vs. Santos and lost 1-6. 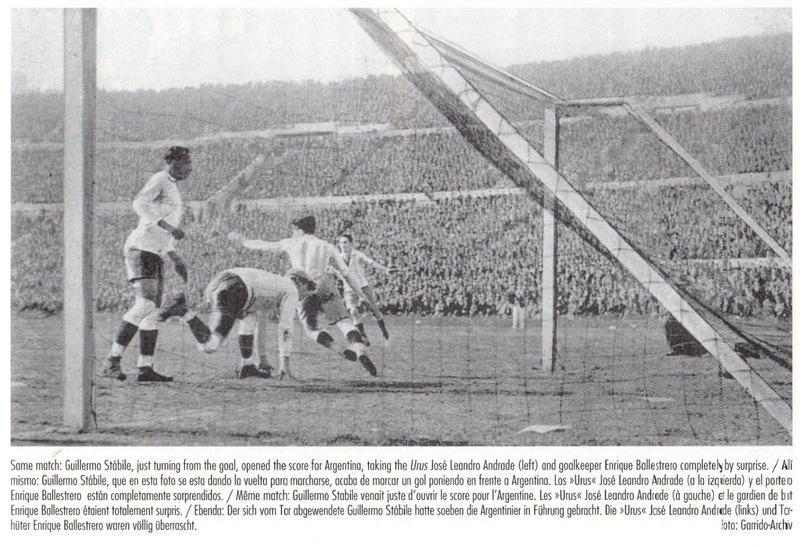 -On August 3rd, Argentina (containing none of the players from the World Cup) defeated Yugoslavia (3-1). The Yugoslavia were on their way back and had a layover in Argentina. -Brazil hosted other Internationals against departing World Cup Teams. Apart from their match on August 1st vs. France (3-2 win), they also hosted Yugoslavia on August 10th. They had lost to the same opponent at the World Cup, but in this match they won (4-1). Just like the French, the Yugoslavian Federation did not consider this as an Official Match in their records. 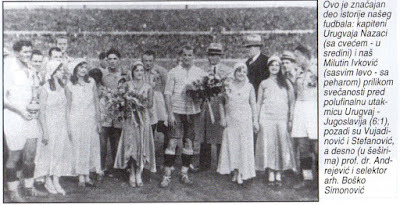 A week later on August 17th, Brazil hosted USA and won (4-3). -On the trip back, Belgian goalkeepers Arnold Badjou and Jean De Bie (May 9, 1892-April 30, 1961) had a physical fight. They presented themselves at the dinner table all bruised and bloodied. They eventually became very good friends. -Argentina played with five different lineups in its five matches. 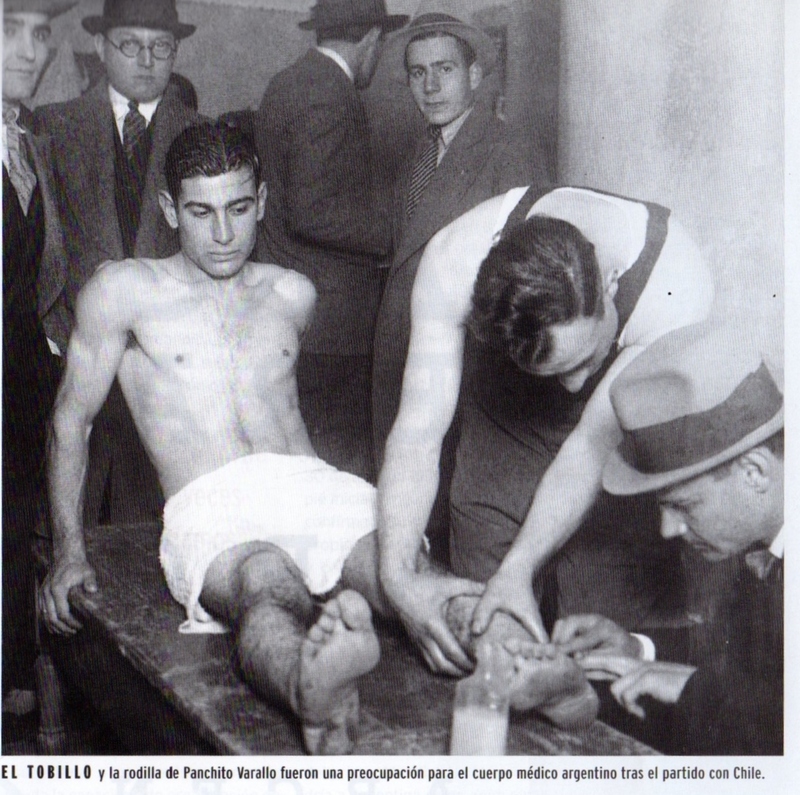 Only Jose Della Torre played in every match. 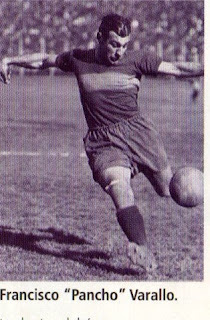 -Argentina’s Alejandro Scopelli (May 12, 1908-October 18, 1987) joined AS Roma in 1933 and became an Oriundi and Italian International. 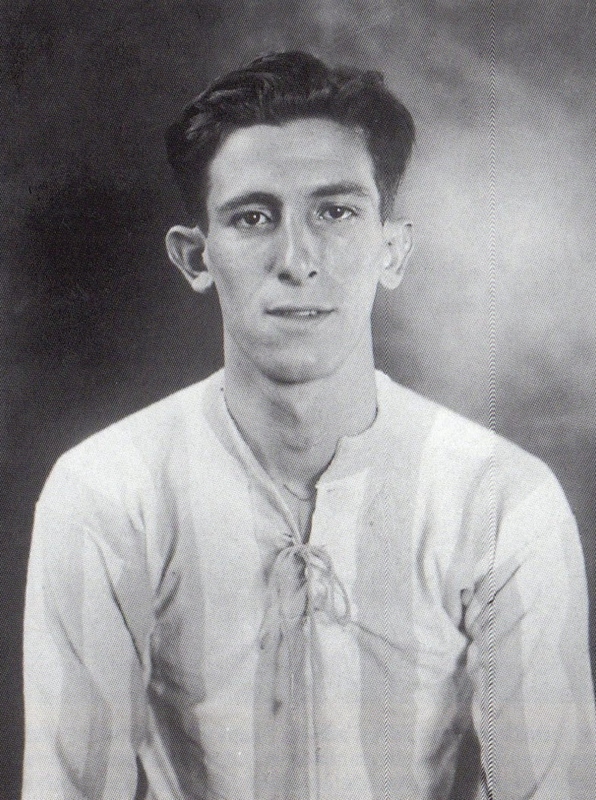 -Argentina’s Carlos Peucelle (September 13, 1908-April 1, 1990) later became the first ever Substitute to score a goal for the Argentinean National Team. 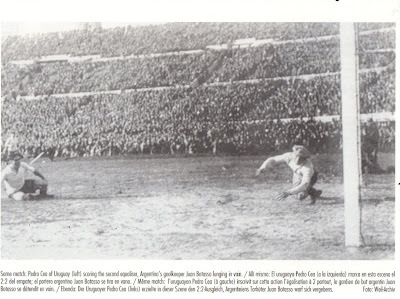 On August 15, 1934, he scored Argentina’s winning goal vs. Uruguay (1-0) after coming on in the second half. -Argentina Captain Manuel Ferreira (October 22, 1905-July 29, 1983) was nicknamed ‘Piloto Olimpico’. 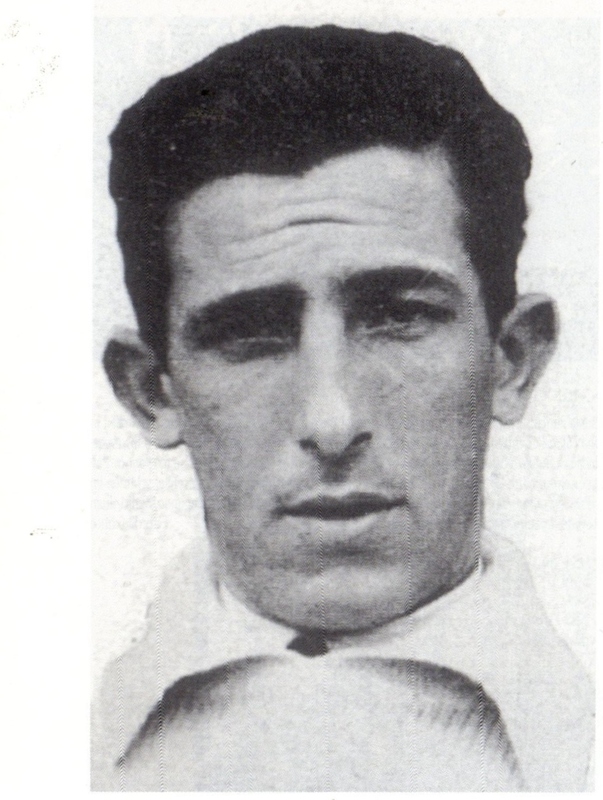 -Yugoslavia’s Ivan Bek (October 29, 1909-June 2, 1953) played for French Club ‘Football Club de Sète 34’ (since 1928). -Yugoslavia’s Captain Dr. Milutin Ivkovic (March 3, 1906-May 23, 1943) was very Politically active. He was part of the movement that favored the boycott of the 1936 Olympics in Berlin. In June 1938, he became the Editor of ‘Mladost’ that had been launched by the Communist Youth League. 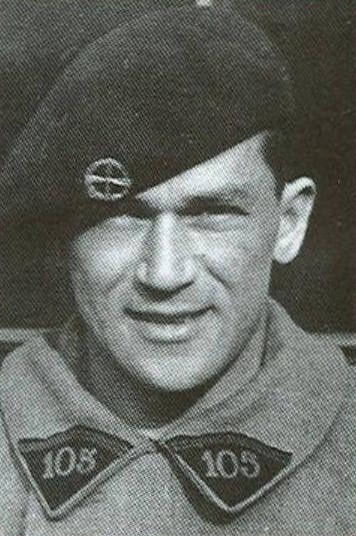 During World War II and the Nazi Occupation, he was affiliated with the Yugoslavian Partisans. He was arrested and executed by the Nazis on May 23, 1943. 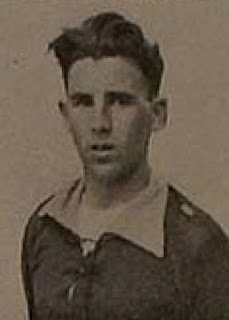 -Argentina’s Atilio Demaria (March 19, 1909-November 11, 1990) later joined Italy’s Ambrosiana-Inter (aka Internazionale Milano) in 1931. He became an Oriundi and Italian International and represented the Italians in the 1934 World Cup and was a member of the victorious side. -Argentina’s Juan and Mario Evaristo were brothers. Juan (June 20, 1902-May 5, 1979) and Mario (December 10, 1908-April 30, 1993) are the only pair of brother to have represented Argentina in the World Cup Finals. 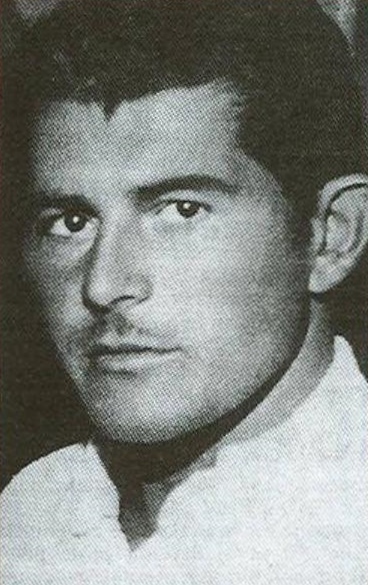 Some sources show Juan Evaristo’s date of death as May 8, 1978. 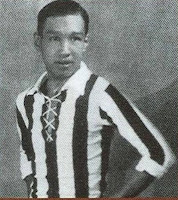 -Peru’s Julio Lores Colan (September 15, 1908-July 15, 1947) later played in Mexico and played for its National Team in the mid-1930s after becoming a Mexican Citizen. -Paraguay’s Aurelio Gonzalez (September 25, 1905-July 9, 1997) fought for his Nation in the ‘Chaco War’ vs. Bolivia (1932-1935). He refused an offer from Argentina’s San Lorenzo to fight in the War. He later coached Paraguay in the 1958 World Cup Finals. 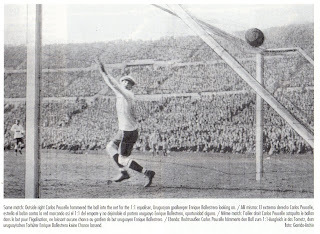 - Yugoslavia goalkeeper Milovan Jaksic (September 21, 1909-December 25, 1953) was also known as ‘El Gran Milovan’. 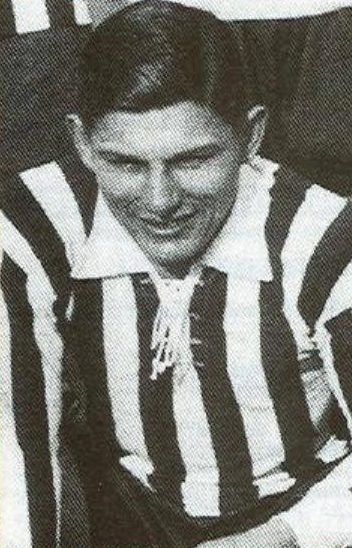 After World War II, he was one of the founders of Red Star Belgrade. -Belgium goalkeeper Arnold Badjou (June 26, 1909, September 17, 1994) was Belgium squad’s last survivor. He was the team’s youngest member and an electrician by trade. He had to borrow 500 Belgian Francs from his club ‘Daring Club de Bruxelles Societe Royale’ to buy clothing for the trip. He recounted how afterwards 300 Belgian Francs were deducted from his pay at the club to compensate the loan. They were all amateurs and according to him the only time he saw money because of football was because of this World Cup trip. He blamed Belgium’s poor showing on lack of proper physical preparation as well as lack of cohesion between the players. 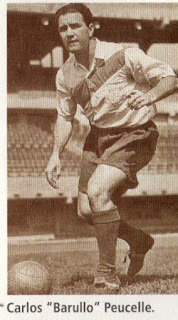 -Argentina’s Guillermo Stabile (January 17, 1905-December 26, 196) was nicknamed ‘El Filtrador’ (The Filter). He joined Italian club Genoa after the World Cup. He was the first ever top goalscorer of a World Cup (8 goals). He managed the Argentina National Team from 1939 to 1958 and also 1960. 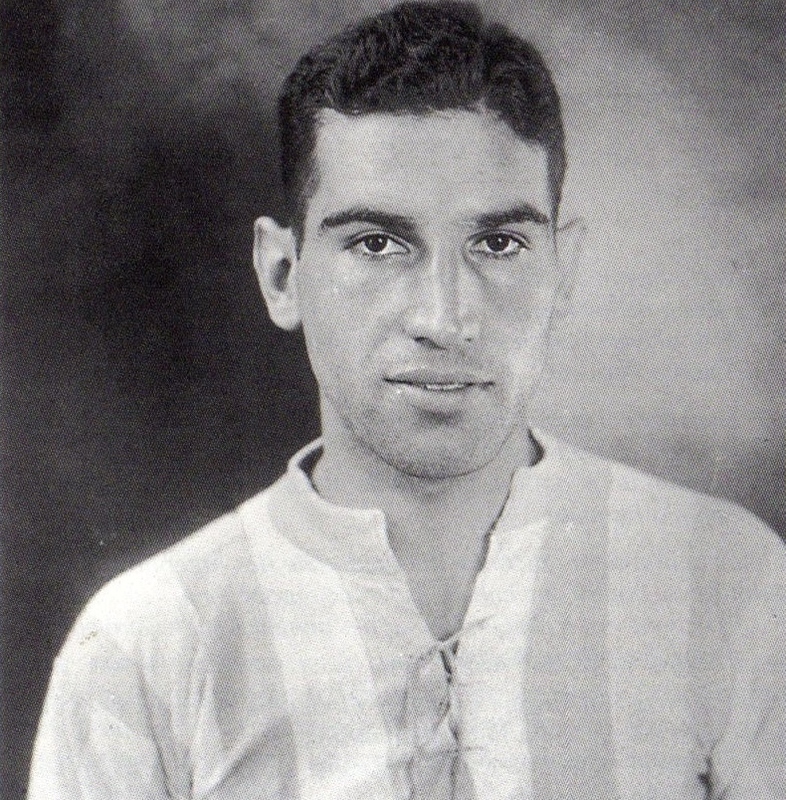 He led Argentina to 6 Copa Americas (1941, 1945, 1946, 1947, 1955, 1957). He had for decades been recognized as the first ever scorer of a hat trick during the World Cup (July 19, Argentina 6-Mexico 3) (Until November 2006 when USA’s Bert Patenaude was recognized for this feat in USA’s match vs. Paraguay on July 17th, 1930 (3-0 win). -Mexico Captain Rafael Garza Gutiérrez (December 13, 1896-July 3, 1974) was the oldest player (as well as the oldest Captain) at the World Cup aged 34. He was nicknamed ‘Record’ and later managed the Mexican National Team. - Juan Jose Tramutola (October 21, 1902-November 30, 1968), one of Argentina’s Managers, was at 27, the youngest Manager at the World Cup. 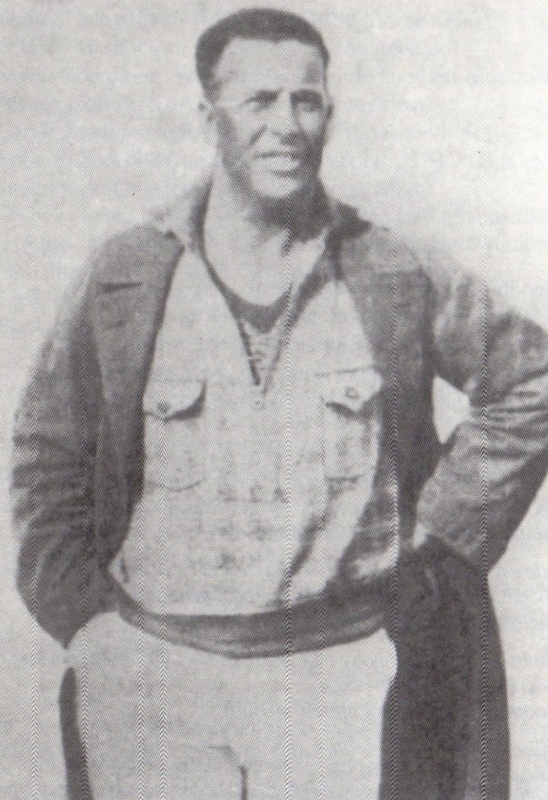 Spanish-born Mexico Manager Juan Luque de Serralonga (May 31, 1882-July 18, 1967) was the oldest Manager, aged 48. -The youngest Referee at the World Cup was Uruguay’s Francisco Matteucci (May 16, 1903-unknown), aged 27. 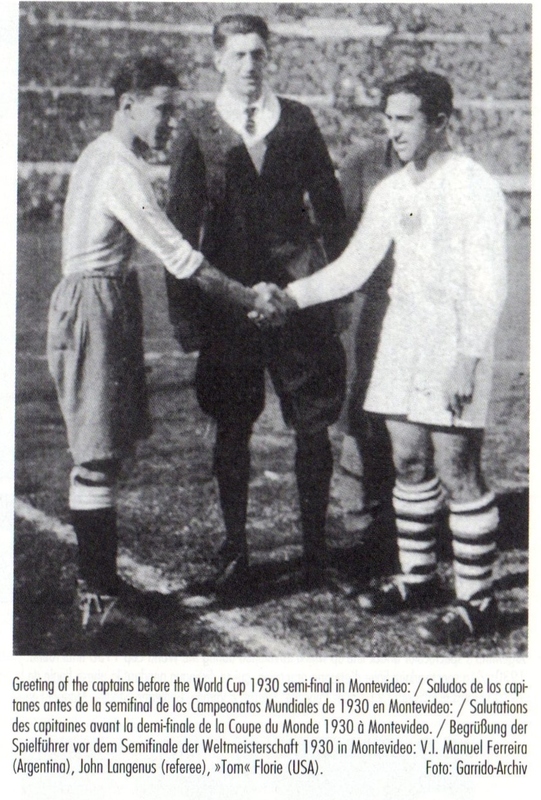 The oldest Referee was Brazil’s Gilberto De Almeida Rego (February 21, 1881-October 21, 1961), aged 48. -This was the only World Cup where not a single match ended in a tie. 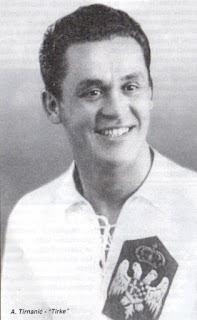 -In 1966, Brazil’s Araken Patuska da Silveira (July 7, 1905-January 24, 1990) in an interview with ‘A Gazeta Esportiva’ disclosed that Brazil squad was divided between cliques. According to Araken, players from Fluminense / Botafogo (that were regarded more aristocratic compared to those from Flamengo and others) received better accommodations on the Ship ‘Conte Verde’ as well as in their ‘Hotel Cave Colon’ in Montevideo. As a result there was no team unity nor spirit. -Mexico’s Manuel and Felipe Rosas were not related. 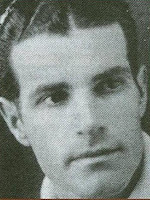 -Bolivia Manager Ulises Saucedo (March 3, 1896-November 21, 1963) also refereed many matches (as well as serving as a Linesman) during the World Cup. 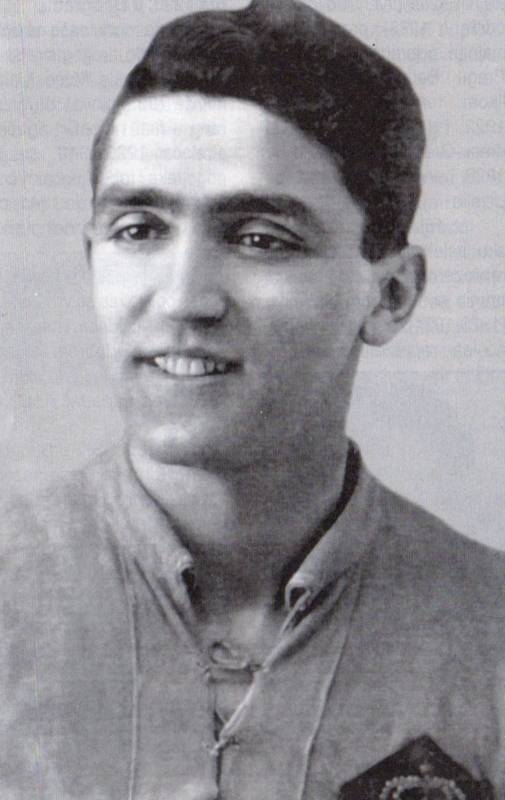 Romania Manager Constantin ‘Costel’ Radulescu (October 5, 1896-December 31, 1981) also served as Linesman during the World Cup. Radulescu fought in the Romanian Army during World War I. 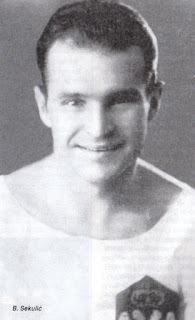 He also participated in the 1936 Winter Olympics in Bobsleigh competition. -There was not a single European Journalist in Uruguay to cover the World Cup. Much of the known accounts from this World Cup are in large part credited to Belgian Referee Johannes (John) Langenus’ testimony. -James Brown (December 31, 1908-November 9, 1994) was USA’s last survivor from this inaugural World Cup. He was Scottish born but left to join his father in USA in September 1927. He had only been a Professional for three months before leaving for the World Cup. For the World Cup he was paid $250 and a suit of clothing. He later joined Manchester United in 1932. According to him in Montevideo, USA’s WM Formation was referred to as the ‘American Style’. Has informed of this, it turns out James Brown was erroneously thought to be the last USA survivor. It was in fact Phillip Slone, who passed away on November 4, 2003, aged 96. 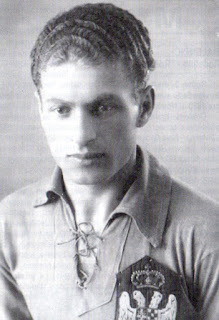 -Argentina’s Luis Monti would join Juventus and was capped by Italy from 1932. He was a member of the 1934 World Cup winning Italian squad. He became the first ever player to play two consecutive Finals with two different Nations. There has been much speculation over the decades about Monti’s poor display in the Final. 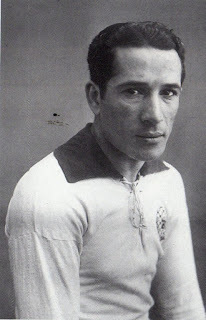 -Uruguay’s Pedro Cea (September 1, 1900 – September 18, 1970) was born in Spain. He later managed Uruguay (1941/42) and won the Copa America in 1942. 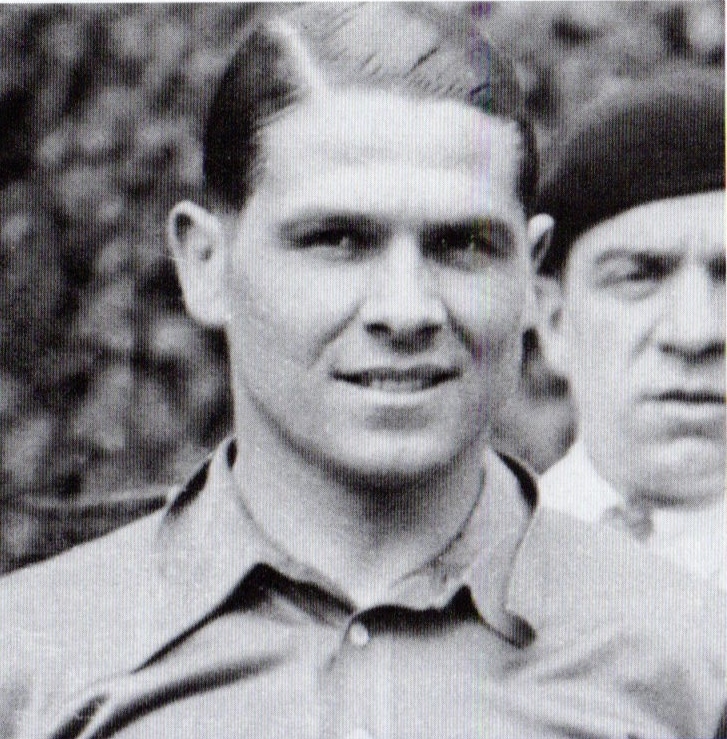 He is the only Uruguayan player to have played in every minute of the 1924 and 1928 Olympics and the 1930 World Cup. - Uruguay’s José Leandro Andrade (October 1, 1901-October 4, 1957) was nicknamed ‘Maravilla Negra’ (The Black Marvel). His Mother was Argentine and his Father was an African-Born Slave who had escaped from Brazil. 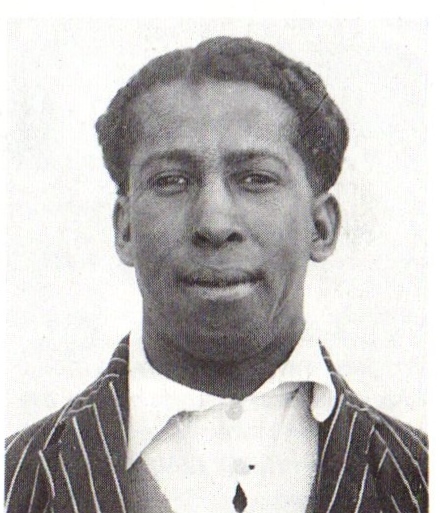 He is considered the first black International Football player due to his presence in the 1924 Olympics. He died poor and an Alcoholic at a Montevideo Assylum. His record stood from 1932 until 2011. 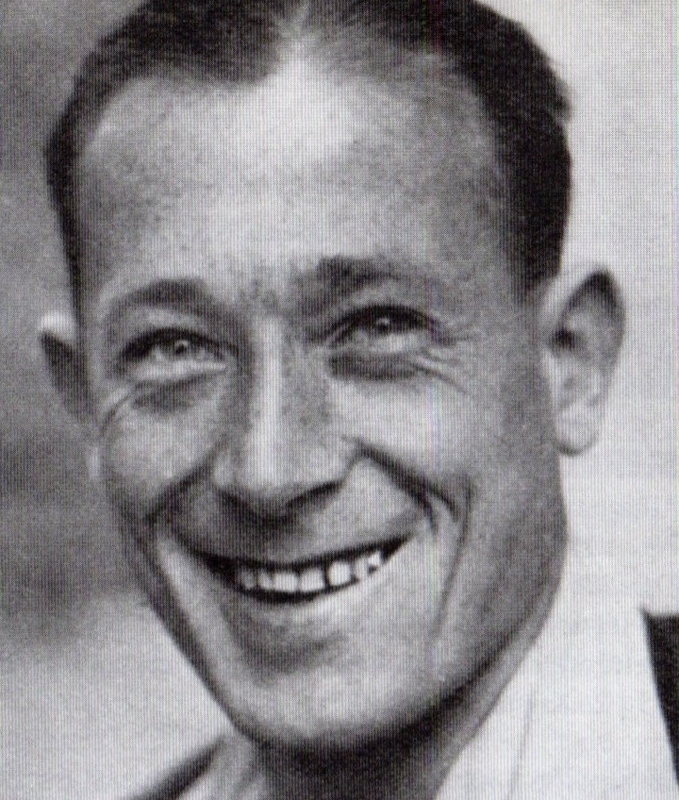 He was the oldest goalscorer at the World Cup (aged 31), as well as the oldest player at the Final. He also managed Real Madrid (1951/52). - Uruguay’s Lorenzo Fernandez (May 20, 1900-November 16, 1973) was born in Spain. As a result he was nicknamed ‘El Gallego’ (The Galician). 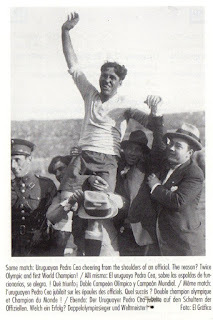 - Uruguay’s Pablo Dorado (June 22, 1908-November 18, 1978) was the youngest World Cup Champion at the World Cup (aged 22). He is also the first ever goalscorer in a World Cup Final. 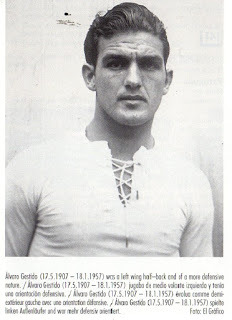 - Uruguay Captain José Nasazzi (May 24, 1901-June 17, 1968) is considered one of the greatest players in the History of Uruguay. He is the first ever Captain to win the World Cup. His nickname was ‘El Gran Mariscal’ (The Grand Marshall). -Years later Argentina’s Carlos Peucelle felt that if the World Cup had taken place in Buenos Aires they would have been Champions. He disclosed of the anonymous threats against Monti (some directed at the life of the player’s mother). Apparently Monti had not wanted to play saying "You Play, I do not go,". He was finally convinced by several of the team leaders, but he was not the same player on the field. 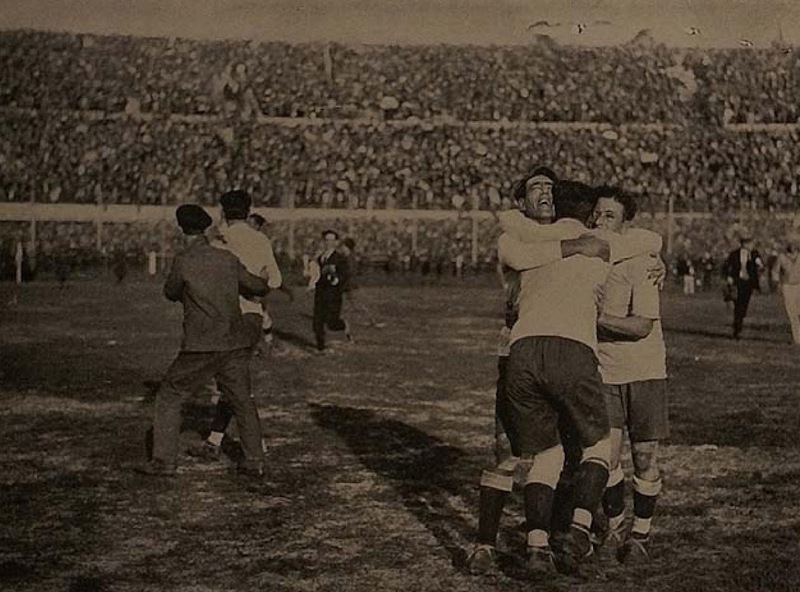 Due to the hostile climate, the Argentineans had threatened that they would walk off if anything incident happened during the match. He also blamed the refereeing that believed had favored the home team. 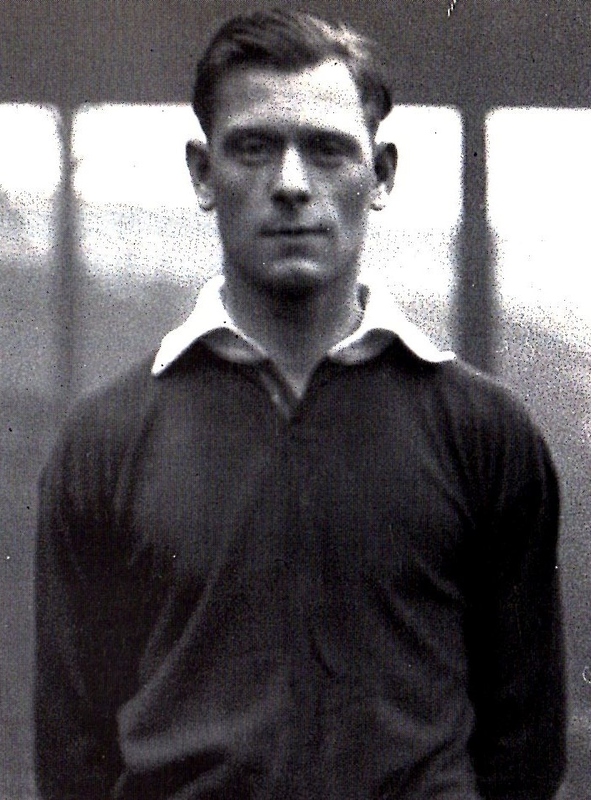 - While he was in Uruguay, Belgium International Nicolaas Hoydonckx (December 29, 1900-February 4, 1985)’s brother had drowned back in Belgium. 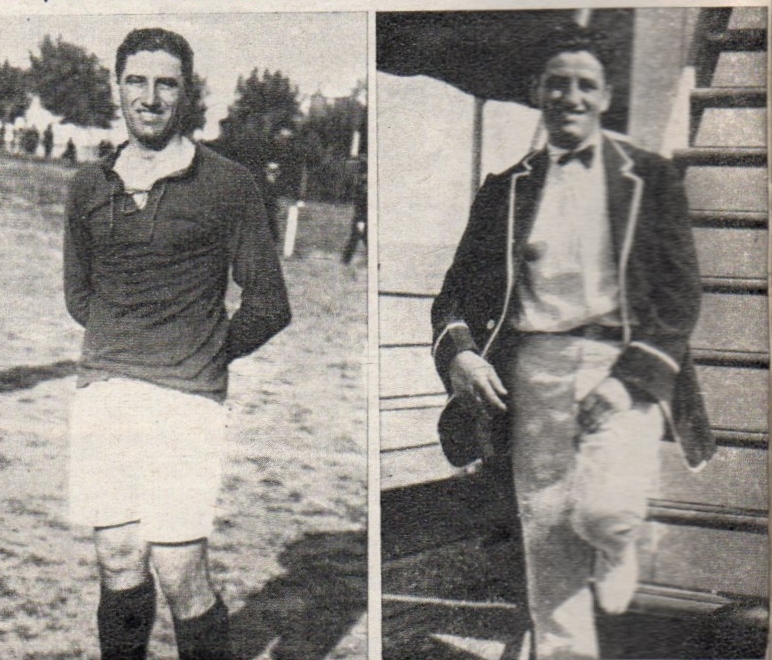 -Belgium’s Bernard Voorhoof (May 10, 1910-February 18, 1974) along with France’s Etienne Mattler (December 25, 1905-March 23, 1986) and Edmond Delfour (November 1, 1907-December 21, 1990) are the only players who took part in the first three World Cups in the 1930 (1930, 1934 and 1938). Bernard Voorhoof was nicknamed ‘voorhoofd’ (forehead in Dutch); his teammate Nicolaas Hoydonckx called him ‘voor-kop’ (to head). Edmond Delfour was charged with the physical preparation of the French Team aboard the ‘SS Conte Verde’. 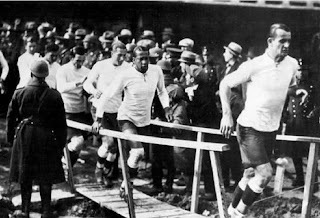 -After his playing career France’s Captain in the 1930 World Cup, Alexandre Villaplane (December 12, 1905-December 26, 1944) became a criminal and a black marketer/racketeer. During the German Occupation in World War II, he became a collaborator and became a Lieutenant in the SS commanding a North African Brigade. They were deployed against the ‘Maquis’ (French Resistance). He had also racketeered and got payments from Jewish families threatening their lives and those of family members. It was estimated his African Brigade had killed 200 people. He was directly linked to 10 murders and was sentenced on December 1, 1944. He was executed by a firing squad on December 26, 1944 at Fort de Montrouge. -Yugoslavia’s Alexander Tirnanič (July 15, 1910-December 13, 1992) was the youngest ever goalscorer in the World Cup (scoring vs. Brazil on July 14th) until Mexico’s Manuel Rosas beat his record in a matter of days (July 19th, Argentina 6-Mexico 3). He is the sixth youngest goalscorer in the history of the World Cup. He managed the Yugoslavia National Team (1953/1960). - Yugoslavia’s Djordje Vujadinovič (December 6, 1909-October 5, 1990) would refuse to be paid for playing Football. He was a Bank Employee (National bank of Yugoslavia) with a comfortable salary. He was nicknamed ‘Leteci Fudbaler’ (the flying footballer); because of his work at the bank he had to travel separately from his teammates and by plane. - Yugoslavia’s Blagoje Marjanovič (September 3, 1907-October 1, 1984) was captured by the Germans during World War II and placed in a Prison Camp. On April 6, 1941, two of his children were killed in the German bombarding on Belgrade. He was later taken prisoner by the Germans and sent to a camp in Germany. Nine months later, the Camp Doctor (Who was with Switzerland’s Grasshopper) provided him a false certificate and placed him in a freight wagon. 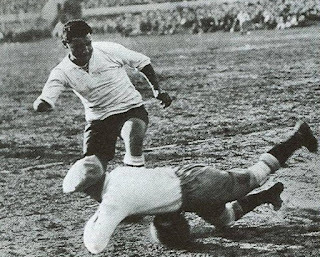 -Argentina’s Francisco Varallo (May 5, 1910-August 30, 2010) was the last ever survivor of this first World Cup. He was the youngest player at the Final (Aged 20). He passed away aged 100 years old. Vasle Juan - Ustavie svet - Mundial je tu!